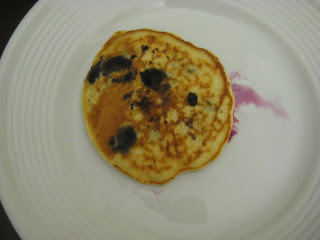 So, I've been meaning to do this post for a while - because I actually made these pancakes sometime in August! I just re-discovered the pictures on my camera. 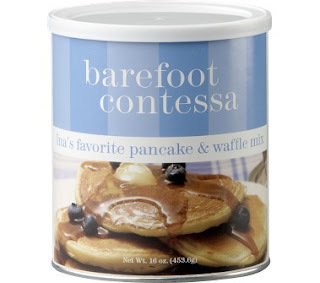 In this post I will be reviewing a product - the Barefoot Contessa favorite pancake and waffle mix! I feel like I have to do this now because I just joined FoodBuzz (see the ad and badge in the sidebar!!) and I don't wan this getting confused with any of the reviews I may be asked to do through the foodbuzz tastemaker program. For the purpose of transparency, I want to make it clear that I have not been compensated at all by the good people at the Barefoot Contessa...they didn't even give me the mix. I received it as a gift from some yankee swap or something - and it had been sitting in my pantry ever since! Rafe's last day in Boston was a sad one - but I thought it would be best to send him off with a special and hearty breakfast. I had a crazy abundance of blueberries, so I thought that Ina Garten plus blueberries must equal delicious...no? So I got set to make his special breakfast. The pancakes cooked up very well. 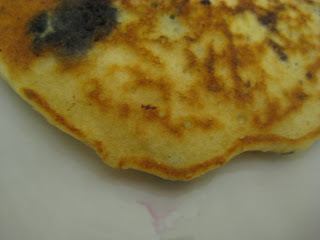 The were fluffy inside, but also got a slightly crisp edge, which I really like on a pancake (I also griddled them in just the tiniest bit of butter). 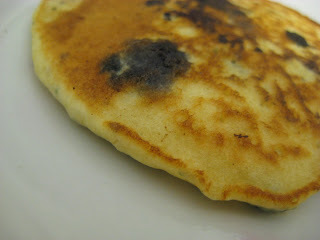 There was a mild malt flavor, which I really like in my pancakes. It makes them taste like the pancakes I used to get at the diner in my hometown. Very authentic! I love the Barefoot Contessa too. I haven't tried any of her pancakes though. I really appreciate your transparency. I hate when I can't tell whether a blogger received something for free. And congrats on joining the featured publisher program. It's really great! You'll love it! Same here! I always wonder if someone is getting paid to mention a brand, or if they're being honest. In the long run I think its better for the companies when bloggers come clean about whether they got an item for free/were compensated. I'm back - and a birthday dinner!